This was a great project for Swansea Accident Management via their excellent creative team, at Shooters Media. 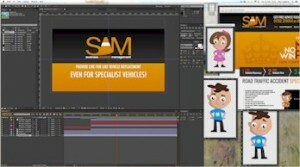 Working with Open Door Media, using the existing branding and graphics, Shooters developed this short web video to promote SAM, who specialise in compensation claims for specialist vehicles. Shooters Media themselves produce high quality corporate videos to suit any and every business. No matter what the budget, they guarantee that every production undertaken will be given the same care, enthusiasm and high production values. I think it turned out rather well – see what you think! Previous post: Nice Little Gig for Chevrolet and DreamWorks! Next post: PRESS RELEASE: Dragons’ Den Star Theo Paphitis Likes Voiceovers… apparently!